Fika (Swedish concept-word for coffee break) is a big deal here and for us expats it is one of the first things we acquire from Swedish culture. For me as an Italian, anything involving coffee is as natural as breathing, therefore I embraced the whole fika-thinking from the beginning. Bryggkaffe (i.e. percolated coffee) is the king during fika. However, a good old espresso always has its charm, even up here. 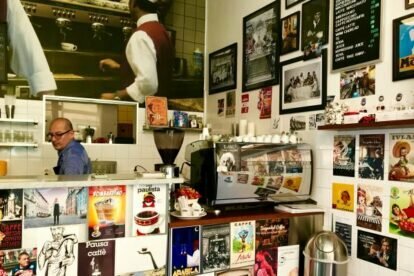 There are tons of bars all over the city serving decent coffee but Caffe Poli, a family-run business founded in the ’60s, delivers an authentic, fully Italian experience. The Caffé is in Kungsholmen, around the corner of the metro station. It’s tiny with just a few seats inside. Throughout the years, Caffe Poli gained a reputation in town and many loyal customers come here every day or during the weekend for an excellent espresso, a pastry or panini. Coffee is not the only reason why people come here: entertainment is the other one. The owner, Pino (among the regulars the place is also known as “Da Pino”), and the other baristas are the heart of Caffé Poli: while making coffee, they love chatting with clients (old and new), telling stories and getting to know the clients a bit better, a bit like an old uncle you do not visit that often. Italian or not, I’m sure that here it’s easy for everyone to feel like a local. Offline Stockholm tips? Get our iPhone / Android app!